Discussion in 'Online Casino Reviews' started by Marina, Jan 4, 2015.
the list until you find one. Only, it’s locked. You’re not allowed to play it. Ordinarily, this might be enough to send some people packing, but not someone playing at Casino Heroes. The website has perfected the art of gamification for… games, for lack of better phrasing. when you’re trying to get your kids to help clean and you have them “shoot baskets” with their dirty clothes. A few online casinos have rolled out this concept to varying degrees. because they force you to advance through levels to unlock games. Casino Heroes, however, takes gamification of games to a whole new level. by a dragon named Betser. Your goal is to beat the 38 bosses he leaves behind and get the crown back. How do you do it? By playing casino games, of course. ones protected by the bosses whom Betser has placed. You have to play games to build up experience points to be able to fight the boss, and those will increase more quickly if you place higher wagers. advancements of other heroes. The company also believes in transparency, so they actually post each game’s active RTP and allow you to choose which one you want to play based on that. like Candy Crush. Once he formed the idea, he spent about a year designing the platform, or the master game, so that it would be unique and deliver a total gaming experience. with Casino Heroes. Although the site is still new, it has established a fairly solid reputation so far. It will be interesting to follow how the story progresses for the hero and for Casino Heroes. Interesting concept. For those that like a challenge, then this is the place. Great review! Love to read some backgorund information form Online Casinos. Casino Saga changed name to Casino Heroes. We have updated this review with their new name. Wasn't there a small contest refering to the new name, where players could win some Freespins?! I don't know dear, did not hear something about such a contest. So they recently changed their name, from Casino Saga to Casino Heroes. 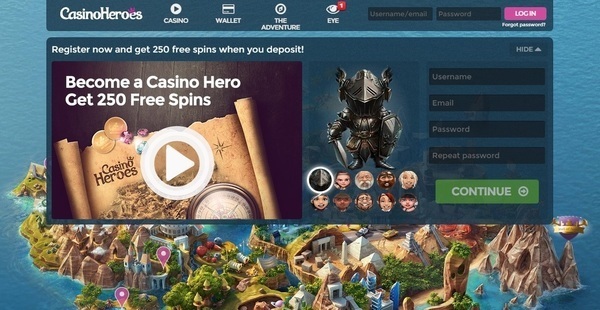 The casino's website design is thrilling and the games give you a feel somewhat similar to role playing games. However, this is merely challenging for players, if you want to play a game you like then work hard for it, only then can you unlock it.